The most common type of hame bell bracket seen in the North American market is a forged steel bracket with three, five, or more bells mounted on it. The bells are usually the open-mouth type, but they are sometimes crotals. Each end of the bracket is attached to the top of the hames. Hames are the wood or metal arms that fit tightly around the leather collar on the horse's neck. The American name for this type of bell assembly is conestoga bells or hame bells. American hame bells are exposed to view, as shown in the photo. Picture postcard: American hame bells were featured on a card postmarked 1920 and was sent from Lancaster, Pennsylvania, to Sydney, New York. 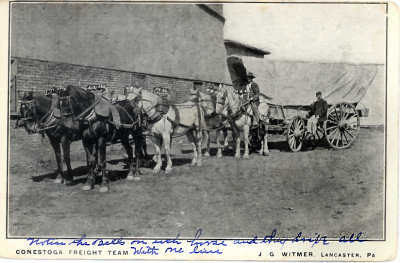 Note below the photo says: "Notice the Bells on each horse and they drive all with one line." Message on the back says: "Just a card now. I will answer your letter in a day or 2. I hope you will help Mama some now. We see lots of these rigs here now. They have nice horses here. Dad." Hame bells existed in other countries as well. The English version, called team bells or lattern bells, have bells on a similar metal bracket, but the bells are protected from the weather under a leather, cloth, or metal housing. The Russian version has one to several open bells mounted under a wooden arch called a duga. The duga rises high above the horse's head and attaches at either end to the vehicle shafts. Saddle bells look a little bit like these traditional Russian bells. A simpler hame bell design used in America and England consists of a pair of small iron brackets. One or two crotals (sleigh bells) are attached to the top of each bracket. The bottom of each bracket slips into a hole drilled into the upper end of a wooden hame or into an iron holder screwed to the hame. 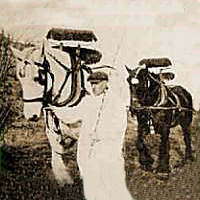 Another type of simple hame bell is used on heavy horses in Belgium. 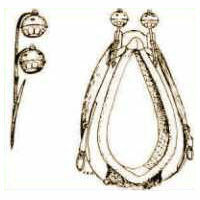 A single crotal (sleigh bell) or open bell is attached to a short buckled strap. The strap is fastened onto a ring at the top of the hame so the bell can swing and jingle freely as the horse moves. Trivia: Possible origins of the saying "I'll be there with bells on." (1) Terry Keegan, Douglas Hughes, Claude A. Brock, Ran Hawthorne. Horse Bells. National Horse Brass Society, Surrey, England. 2nd ed. 1988.